Our Pear tree varieties are grown on a ‘Quince A’ rootstock which gives them moderate vigour and guarantees early fruiting. 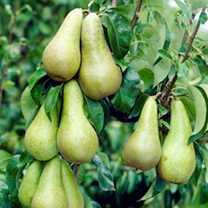 You will also be glad to know that Pears are one of the easiest fruits to grow – so ideal for beginners. 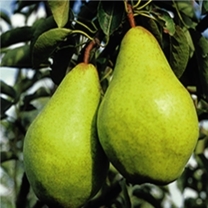 There are plenty of pear trees which you may want to grow such as the Invincible Pear, Asian pear or even the small, sweet and heavy-cropping Petite Poire! 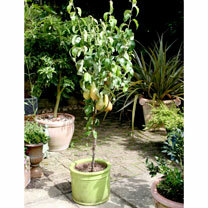 Browse our range of pear trees and try something different today. You can trust that your pear tree will be despatched at just the right time for you to successfully plant and grow it in your garden. All our trees are hardy to the weather so you can be rest assured that they will survive in all seasons. Quality guaranteed! While very similar to apples in many ways, pears have a number of differences. Firstly they will live and produce fruit for a lot longer once established. They also prefer a warmer and sunnier site that is very well sheltered. Coming into blossom earlier than apples by at least a fortnight, the pear is far more susceptible to late frost damage too. And of course the soil requirements are different, they thrive in most soils including slightly heavier soil than apples will tolerate as these will not dry out quickly, and suffer from very few pests and diseases. 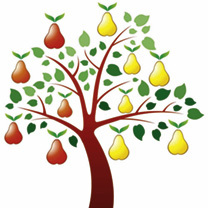 Pear trees aren't generally self fertile so two compatible trees are needed. They can be grown and trained in the same way as apples such as cordons, espaliers and bushes. 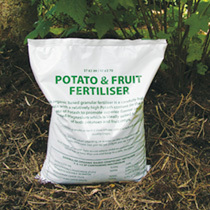 Feed and prune in the same manner as apples. Watering is extremely important with pear trees, they will not tolerate drought and be sure to water well while the fruit is swelling. Planting time is best between November and February for bare root trees, even potted trees are best planted in the winter while dormant. Stake the pear tree when planting to avoid damaging roots later. With pears it is possible to remove the stake when the tree is strong enough. Thinning is advisable too, taking out smaller and blemished fruitlets and leaving about 10cm (4") between each one. It seems harsh, but the remaining fruit will develop into better quality pears. Very early pears are ripe for picking when the skin begins to change colour at the bottom of the fruit; these can be eaten straight away. 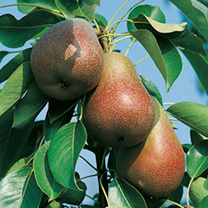 Early pears are ripe when the colour changes around the stalk, store for a week before eating. 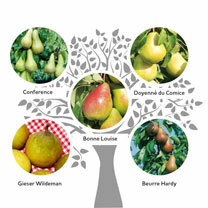 As a rule pears do not store well and it varies between varieties. Some will only keep for a few weeks, others will last, with care and plenty of ventilation, until Christmas.